After months of threats and recriminations, talks between the six key nations involved in the crisis over North Korea's nuclear ambitions have begun in Beijing. But hopes are not high for immediate results from the summit. North Korea's official media repeated on Wednesday that the talks would fail unless Washington was ready to offer a non-aggression pact. The Bush administration is meanwhile continuing to insist that North Korea must scrap its weapons programme in a verifiable and irreversible manner. Before the meeting got under way, China - the host - called for restraint, and warned that hardline positions would only deepen the dispute and threaten peace in the region. Delegates from North and South Korea, Russia, China, Japan and the United States shook hands before sitting down around a hexagonal table at Beijing's state guest house on Wednesday morning. 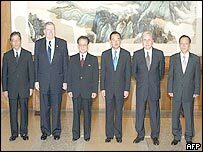 The US and North Korea were placed next to each other, so they would be able to talk informally between sessions, according to the BBC's Charles Scanlon in Beijing. Head of the Chinese delegation, Vice-Foreign Minister Wang Yi, told the assembled diplomats: "A warm welcome to you all. I am very happy the six countries are all here." The rest of the morning's proceedings took place behind closed doors, but a spokesman for South Korea's delegation said: "The talks proceeded smoothly in a relaxed and quiet atmosphere." Officials said that all sides had expressed a willingness to co-operate throughout the three days of discussions. But delegates admit that the chances of a deal are poor. One former South Korean diplomat said on Tuesday that the talks would be judged a success if a second meeting was agreed. The US wants to increase regional pressure on Pyongyang to give up its nuclear programme, but China, Russia and South Korea fear the US is pushing too hard, our correspondent says. Japan is also seeking progress on the kidnapping of its citizens by North Korea during the Cold War, further complicating the agenda. For its part, North Korea fears it may become the target of a US-led attack, and has called for a legally binding non-aggression pact with Washington. "This would be a key to the success of the six-way talks. Without this, it would be impossible to expect any substantial results from the talks," North Korea's official newspaper, Rodong Sinmun, said on Wednesday. But US officials have warned that a non-aggression treaty would never obtain congressional approval, although Secretary of State Colin Powell has suggested that a less formal arrangement might be possible. There are signs in Washington that those who favour moderate engagement with North Korea are being moved aside. On the eve of the talks, the US State Department announced the resignation of its main negotiator with the North Koreans, Jack Pritchard. The department emphatically denied he was forced to quit, but his departure at such a vital moment suggests the hawkish view may have become more dominant, said the BBC's David Bamford in Washington. Washington's hawks advocate a policy of pressure and isolation in America's dealings with North Korea. 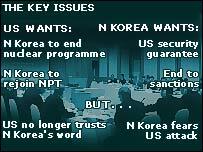 They say that even a discussion of Pyongyang's demands shows weakness in the face of nuclear threat. The nuclear crisis, which has soured already tense relations, started in October when the US announced that North Korea had admitted to a secret nuclear arms programme. Since then North Korea has restarted a mothballed nuclear power station, thrown out inspectors from the UN's International Atomic Energy Agency and pulled out of the nuclear non-proliferation treaty. "No one is expecting an early breakthrough"